A recent Harvard study found that barefoot running causes less impact (and bodily harm) than running in high-tech shoes. Apparently, shod runners land hard on their heels, while shoeless (or minimally shod) runners strike the ground on the springier fore- or mid-foot, which cushions the impact. Even before this study was published, a small movement toward less cushioned, less supportive shoes was, well, afoot. Nike Free and Vibram FiveFingers (which look like high-tech, low-profile tabis and are geared not only for running but also for water sports and hmm, yoga) exemplify that trend. Christopher McDougall wrote a book, Born to Run, on the phenomenal barefoot running culture of the Tarahumara Indians (see Amazon for an author interview). Experts seems divided on the actual benefits and feasibility of bare-footed running, perhaps because modern humans are trained from early childhood to wear shoes. See this February 2010 debate on barefoot running in Runner’s World. But a contingent of runners rave about minimalist shoes, as exemplified by Tim Ferriss’s 2009 review (and wave of positive comments). I’m a big advocate of going barefoot indoors. Where I grew up, all households followed the Japanese custom of removing shoes at the door (which I’d recommend for all humans, although I’m less vocal about it than the Shoes Off at the Door, Please blogger, who’s a Christian Fundamentalist, believe it or not). I’ve spent half my life sans shoes—a habit that I believe cultivated my toe and foot mobility. That said, long-distance barefoot running sounds risky, if not crazy. Even if kids went barefoot playing kickball in PE, they switched to running shoes to run track or cross-country. No one considered running a marathon without Adidas or Nikes! In my experience, running shoes with just the right amount of arch support and cushioning help prevent shin splints and other impact injuries. Perhaps the key is to run with a light stride, “brushing” the ground rather than stomping. (I’ve heard that the heel-to-toe roll was “invented” by Nike in the 1950s.) I have a new pair of Brooks hibernating in my closet. 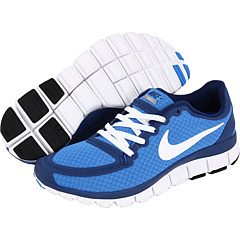 Still, I’m intrigued by the minimalist Nike Free and even those weird, wacky FiveFingers. Note: This post only tangentially relates to yoga, but it’s about feet, the foundation of asana (and among my obsessions!). I found that many of the one-foot balance asanas helped prepare my feet and ankles for barefoot running. Good posture and core strength are two other elements closely related between the two activities. Another bonus of barefooting is that running feels more meditative. Because it requires more focus than running shod, I find that I will sometimes enter that same kind of mental zone I achieve during a good session of yoga. Do you run on grass and trails? Or asphalt and concrete? I cannot imagine running on the latter in FiveFingers (much less barefoot!). Do you, too, agree with Emma that I should avoid pavement? Re FiveFingers, John Durant of http://www.hunter-gatherer.com (another advocate of that faddish Paleo diet) was on The Colbert Report last night. And guess what he was wearing! I’ve tried all sorts of surfaces in my FiveFingers, and they work great for all of them, once I got the whole light-landing step figured out. The only problem I have had with them has been running a mountain bike trail too zealously and bruising the arch of my foot on a log after a jump. Barefooting has been about the same, although I can’t last nearly as long yet. I still need to build up those callouses and work on my form. I find it’s actually easier to run barefoot on asphalt or concrete because of the even surface and visibility. I don’t worry as much about a hidden nail or chunk of glass on the pavement. But there’s nothing better than running through the woods barefoot. One of the best things about running barefoot is the instant feedback. Without shoes on to mask the impact, you can tell exactly how you’re landing on the ground, and if it hurts, you’re doing it wrong. That’s why I think pavement works just as well — if not better — than other surfaces. I started out by throwing off my shoes on walks around the neighborhood with my dog. That was a good way to build up my feet without pressing too hard. Running on grass is a good way to get used to the technique, too. I caught a clip of that interview with Durant. It’s an interesting idea. At the least I think eating like a caveman might help you better appreciate the source of your food and the life taken to provide it. in general, steer away from running on pavement, if you can. it makes it all the harder on the body.. Thanks for the link. I do appreciate it. Not a runner, but I’ll tell my wife Jane about this. i try to spend as much time barefoot as possible (i loved the japanese custom of removing shoes to go indoors ~ and so many cute slippers! ), but i don’t think i could do it while running. and definitely not on pavement or asphalt, and on any dirty old sidewalks. I adore my FiveFingers. I don’t run, but I do walk everywhere in them in the warmer months (I’m in MI)–grass, concrete, dirt, whatever. I believe my yoga is what prepared my feet to be able to support themselves and work efficiently as they were designed to do. I love the feel of all the textures on the ground and how I can feel all the muscles of my feet and legs adjusting to the ground as I stride along. And it’s nice to fit in a little impromptu yoga here and there without taking off my shoes–you can still grasp your big toe with the Fivefingers on.